TheGunBlog.ca — Fewer than two Canadians a year are charged with making so-called “straw purchases” of guns, according to a researcher who analyzed public reports. Here’s a look at the numbers in context, why the RCMP doesn’t have the data, and what it all means. No stats. Canada doesn’t have any official statistics on the matter, the RCMP told TheGunBlog.ca. Unsupported claims. A few government and police officials have said illegal “straw buyers” are a concern, but they haven’t provided any evidence. 1.6 people per year. A researcher dug through public documents from the past 16 years and found 1.6 people are charged each year on average. Some years have zero, other years have four times the average. Too small to see. The government could invest millions of dollars on a rounding error that wouldn’t show up in the statistics. In other words, nobody would notice. you aren’t getting all our intel, info and insight. The theme of illegal “straw purchases” has popped up in recent months. A few government and police officials use it to push new restrictions on 2.2 million Canadian hunters, farmers and sport shooters. Bill Blair, the minister examining a ban on more than a million guns and a ban on home firearm storage, is one of the politicians who regularly mentions “straw purchasers.” He has said it’s a concern, without showing why. A “straw buyer” is someone who uses their gun licence to buy a firearm for someone without a licence. It’s a crime because all guns are banned for everyone without a firearm Possession and Acquisition Licence (PAL) authorized by the Royal Canadian Mounted Police. Most gun stores won’t even show you a gun until you show them your permit. The Ottawa-based RCMP, the federal agency in charge of licensing and tracking gun owners, has told several people asking for statistics on straw buyers that it doesn’t have the data. It’s one of the rare times the RCMP explained the reason why it doesn’t have the data. Regina Police Chief Evan Bray, who heads a committee on guns for the Canadian Association of Chiefs of Police, a lobby group, was quoted by CBC News last month as referencing straw purchasers as an issue. TheGunBlog.ca didn’t get a reply after e-mailing Bray and the CACP at the time for information. An officer with the Alberta Law Enforcement Response Team (ALERT) was quoted by CBC News in June as saying straw purchasing was the “main source” of supply to criminals. TheGunBlog.ca didn’t get a reply after e-mailing the organization for the data in September. Statistics Canada said last year that total “gun crime” is less than 0.5 percent of all crime. That includes a hodgepodge of offences with and without firearms. It’s impossible to derive the number of straw buyers. The RCMP Commissioner of Firearms report for 2017 said 2,663 people had their gun licences revoked that year, of whom 1,546 for “Court-ordered prohibition/probation.” It doesn’t provide greater detail on that category. A researcher scoured reports from the RCMP, courts and newspapers to find 26 cases of straw buyers since 2003 (16 years), for an average of 1.6 people per year. That’s about 0.0004 percent of PAL holders per year. TheGunBlog.ca hasn’t verified all the information. Some years, such as 2017, show zero cases, others show four times the average. Some straw purchasers are never caught. Some instances aren’t public. Dozens of cases are being investigated or before the courts, police have said privately to TheGunBlog.ca. “We actually have no idea how big or how small of a problem this is,” Jordana Goldlist, a lawyer in Toronto who defends clients against charges relating to guns, told TheGunBlog.ca last week. The only way to check would be for the RCMP to cross-reference convictions for these counts against the database of PAL holders, she said. It’s hard to find appropriate sentencing case law, Goldlist said. Shane Daly, a gun owner in Ontario, asked the RCMP for its data on straw purchasers to fact-check what he called “baseless” claims by government and police. Daly shared the response with TheGunBlog.ca last month. See below. 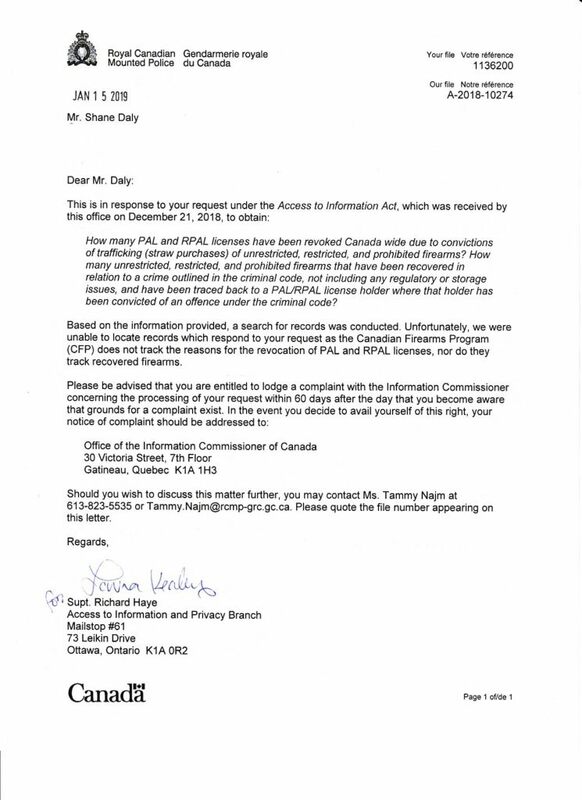 TheGunBlog.ca contacted the RCMP this month to check the facts and ask for any relevant information or context. Dennis Young, a former RCMP officer and now an independent researcher, has filed many similar requests and obtained similar results. No Evidence. The RCMP response suggests the evidence for the government’s claims on “straw buyers” doesn’t exist. The government may not be wrong in its concern, but hasn’t demonstrated any reason for it. Simpler Rules? Research prepared for the government in 2010 shows people get guns illegally for self-protection and to avoid excessive regulations. Simpler rules could encourage compliance by people with good intentions. It’s next to impossible to stop people with bad intentions. RCMP Job Description. Let’s say the RCMP is fulfilling perfectly its mandate on gun-owner licensing and tracking. Is it tracking the right group? Does this serve public safety? Does the licensing system serve the right purpose? On this issue, does the federal police serve the right mandate? Illegal or stolen firearms seized or found at crime scenes are deemed to be in the custody of the police force of jurisdiction, and kept for evidentiary purposes. Processes and/or policies may differ from one agency to another, as well as reporting requirements. Currently, there is no national repository for this type of information in Canada. The Canadian Firearms Program (CFP) is a national program within the RCMP. It administers the Firearms Act and regulations, provides support to law enforcement and promotes firearms safety. However, the Program is not mandated to collect statistics with regard to straw purchases, nor maintain records of firearms used in crimes. Chief Firearms Officers (CFO) for each Province and Territory investigate public safety concerns and take appropriate action, where warranted. The CFOs may refuse a licence, place conditions on a licence that limit the use of a firearm, or revoke a firearms licence, all in the interest of public safety.